The international crisis posed by refugees from the Syrian civil war and other conflicts has raised questions about whether all States are doing enough. Church and religious groups are saying the United States should resettle at least 100,000 Syrian refugees in the next year and other countries face calls to do more. Secular groups, the U.S. Conference of Catholic Bishops, the Lutheran Immigration and Refugee Service, and the Jewish refugee assistance agency HIAS have backed the 100,000 figures proposed by Church World Service. CWS works in partnership with the World Council of Churches and ACT Alliance and has also called for the U.S. to increase its total resettlement commitment to 100,000 from other parts of the world. But it not the only the United States and Europe that are being asked to pull their weight in solving the world refugee crisis. There are calls for other countries like the Gulf States, Russia and Japan to step in and accept people. The 3.8 million refugees from Syria (95 per cent) are in just five countries Turkey, Lebanon, Jordan, Iraq and Egypt, Amnesty International notes. 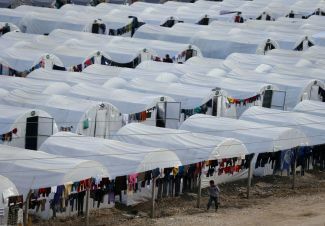 • The six Gulf countries - Qatar, United Arab Emirates, Saudi Arabia, Kuwait and Bahrain - have offered zero resettlement places to Syrian refugees. • Other high income countries including Russia, Japan, Singapore and South Korea have also offered zero resettlement places. The US and Nato are concerned over reports that Russia is increasing its military presence in Syria. Russia, a key ally of Syria during its four-year civil war, says it has sent military experts but that is all. Some commentators say that without Moscow's backing, Syrian President Bashar al-Assad may have fallen by now. At the same time, Lebanon hosts more than one million refugees registered with UNHCR, which amounts to around 26 per cent of the country's population. "The obligation and responsibility to refugees and persons in distress is not defined by their proximity to the place that caused the problem," Peter Sutherland, the Special Representative of the U.N. Secretary-General for Migration and Development told journalists Sept. 8. "I think it's important to make that point," he said noting "the burden that is being taken at the moment by Lebanon, Turkey and Jordan, and the burden in European terms, taken by frontline States of the Mediterranean and in particular Greece and Italy." "In earlier crises, for example Vietnam and the Vietnamese boat people, over a million people were concerned - or indeed in 1956, the Hungarian Revolution. There was a global acceptance of a responsibility in terms of refugees," said Sutherland at the United Nations in Geneva. He noted that at time of the Vietnam refugee crisis, an international conference was convened and responsibilities were taken across the globe. U.N. Secretary-General Ban Ki-moon on Sept. 9 discussed the refugee and migrant crisis with UK Prime Minister David Cameron in while conferring with European leaders on what has become the biggest influx of people into the continent in decades. Church groups and NGOs have criticized migrant wary Britain of being woefully insufficient in its response to the European refugee crisis. And in Saudi Arabia, Kuwait, Bahrain, Qatar, Oman and the UAE officials defend themselves by noting that each has given millions of dollars to the United Nations to help the refugees. The UAE says it's given more than $530 million in relief aid. 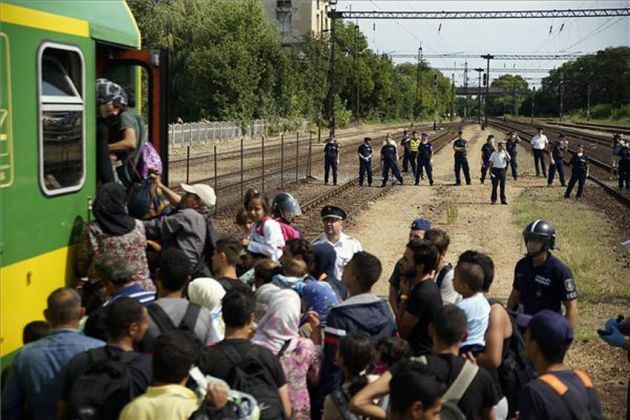 They stress that Syrians have entered Gulf states on visas, and stayed, CNN reported Sept. 8. When some countries take no refugees, including, for example a number of the Arab countries close to Syria or where others argue that financial contributions are the to be used "for their contribution to a dreadful situation, let me say that that, in my opinion, is not enough," said Sutherland. 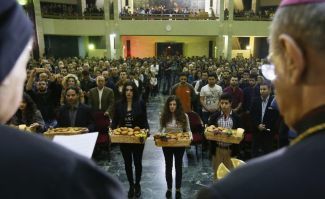 (Photo: REUTERS / Jamal Saidi)Priests offer prayers as worshipers carry bread for the communion during a service for around 600 Iraqi Christian refugees at a church in Hazmiyeh, near Beirut December 12, 2014. Iraqi Christians who sought refuge in Lebanon after Islamist militants tore through their homeland said they had no idea when they would be able to return as they gathered for prayers ahead of Christmas. "Refugees have to be dealt with as human beings. The broader migrant community, including economic migrants, cannot be dismissed with the wave of the hand, and a simple statement that all economic migrants should be sent home." Linda Hartke, president of Lutheran Immigration and Refugee Service said LIRS is petitioning U.S. President Barack Obama. The petition call for the protection of "all vulnerable people seeking safety, particularly religious minorities that include Christian brothers and sisters, and those especially vulnerable people fleeing persecution in Syria who are especially at risk. The petition says that Christianity calls on caring for those in need. "As a nation that has proudly stood as a beacon of hope for those in need, we are defined by our commitment to compassion for the vulnerable and justice for all. We ask that you stand with people of faith by welcoming Syrian refugees into the United States," the LIRS petition says. LIRS' Hartke says, "The Syrian conflict has caused one of the largest refugee exoduses in recent history and has forced more than 4 million people, more than half of whom are children, to flee their homes in search of safety. "In addition, widespread human rights violations perpetrated by the Islamic State of Iraq and the Levant (ISIL or ISIS) have left more than 10 million people in need of humanitarian assistance and protection within Syria and in surrounding countries."